Don't Bother to Knock is Marilyn Monroe's first starring role. 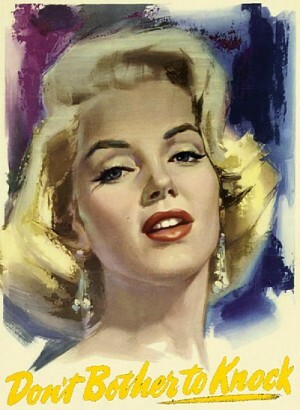 If you have never seen this movie you may be surprised because it is a very un-Marilyn like role. Part psychological drama and part thriller, the film remains one of Marilyn Monroe's best dramatic performances. -- "River Of No Return"
-- "Marilyn Monroe: The Diamond Collection"